My grandmother would be proud. I'm collecting stamps again. She tried to instill her love of philately in me when I was a kid and it worked for awhile. But competition with baseball, football, and other 12-year-old pursuits gradually eradicated the desire to collect and organize stamps into albums. I really had no focus either, except that I liked First Day Covers and plate blocks. 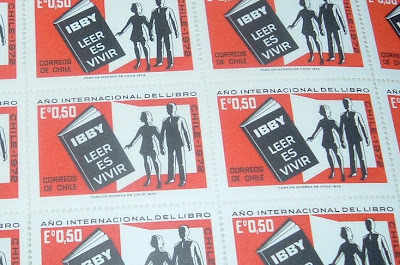 Flash forward 40 years and I'm on the prowl for book-related philately. And the FDCs and plate blocks are getting my attention, as well as a growing list of other items. 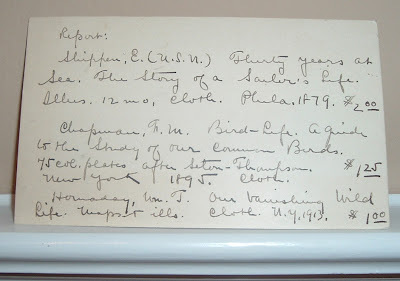 I've been wanting to post something about bibliophilately, a term I found while researching book-related postal history. It would be inaccurate to call topical stamps bibliophemera, but the relationship between bibliophilately and bibliophemera is close enough in my judgment to warrant a mention on this blog. 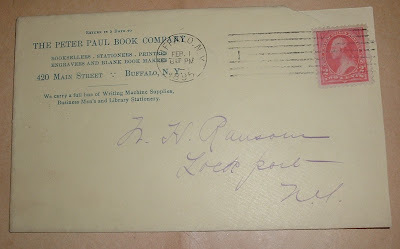 And for now, postal history is a subset of my ephemera collection. As the collection grows, I'm sure I will separate it from the ephemera and let the collection stand on its own, as it should. I don't have enough (stamps or knowledge) that I can comment in-depth on the topic, but others do and I look forward to learning from them. 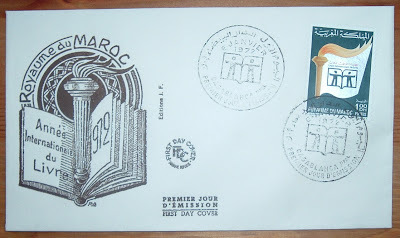 Usage of stamps and other philately - related items whose content is book-related - in the broadest sense - in order to create a topical philately collection, which covers the history of books, institutions and people who are famous for developing them; it also represents books educational inspirations and their role in the fight against illiteracy and in the propagation of education at schools, as well as knowledge at colleges and universities. This topical collection is further defined by 13 subtopics, so any previous perceptions I had about this being a narrowly focused area of collecting have turned out to be misperceptions. I might take a cue from Ben Kaden at Bibliophilately and focus on a subset of the subtopics. He collects and blogs about library-related bibliophilately. Larry T. Nix also focuses on libraries and has created The Library History Buff Site to promote his passion for the appreciation, enjoyment, and preservation of library history. As I alluded to earlier, philatelic items belong to philately, not ephemera, so bibliophilately is not really a kind of bibliophemera. They are standalone collecting disciplines, the children of different parents. But I think they are close cousins. Now, to get a bibliophemera spin on this post, I learned that bibliophilately is symbolized by a cresset, and a cresset is a burning oil lamp. And the burning oil lamp is an international symbol of the fight against illiteracy. I didn't know any of that. 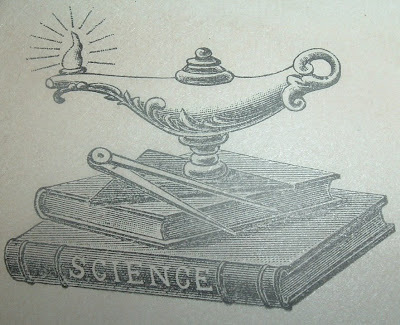 But I did remember that I had an old bookseller's ad cover with the oil lamp logo. So I went fishing through my "archives" and found it. In the cover below, the cresset sits atop a stack of books. I assume the bookseller knew that symbolism behind this and maybe saw himself as an ambassador for eradicating scientific and technical illiteracy. With literacy, or lack of, becoming a crisis in this country (US), we should have more cressets. A cresset in every classroom. I'll sign off with an example of bibliophilately that features a cresset. 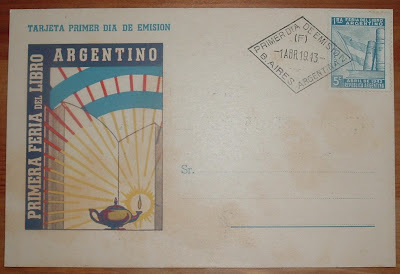 This Argentina postal card and stamp both commemorate the first book fair in that country. And a cresset lights the literate way. 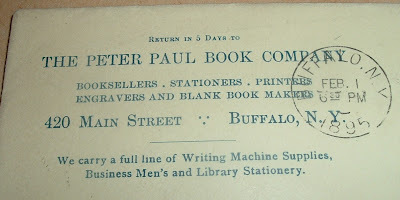 This ad cover for the Peter Paul Book Company (did they sell candy bars, too?) is devoid of any attention-grabbing vignette or decoration, but it caught my eye nonetheless. In small print beneath the company's particulars are the words: "We carry a full line of Writing Machine supplies." These booksellers, stationers, printers, etc. 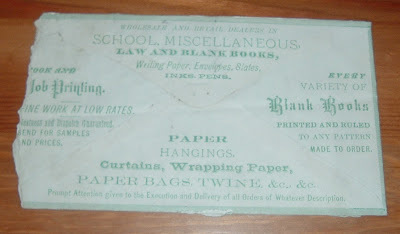 sold supplies for writing machines, but not the actual writing machine. I assumed, correctly, they were referring to typewriters, but I wasn't completely sure. I don't recall ever having heard a typewriter referred to as a writing machine. Before my time, I guess. The Classic Typewriter Page: The Percy Smock Corner - Resources for the Typewriter Collector, by Richard Polt. Percy Smock was a pioneer typewriter collector. A nice bibliography here for books, in and out of print, about typewriters. Periodicals listed also. The Literary Piano, a Time Magazine article from 1954 that reviews two books about the invention of the typewriter and its effects on the writing culture. These books sound like an interesting read because of current technology and the further decline of written communication. Today's concerns and fears echo similar thoughts from the late 1800s. With email and texting today, is handwriting a dying art? And with Amazon's Kindle, and other reading machines sure to come along, is bookselling (real books) a dying art? As this ad cover led me to discover, the antiquated technology of a typewriter once posed questions about the demise of handwriting. It's still around. Current technology poses questions about the viability of bound books and bookselling. The jury's still out on these issues, but I feel certain the verdict will be favorable to both: Books, like handwriting, aren't going away. Coincidentally, I had a conversation about books and Kindles with my dentist last night while getting a root canal (pre-drilling, waiting for the Novocaine to kick in). I highly recommend a bibliophile endodontist when going through something like that! Last week, a Japanese bookstore trade label got my attention and a Vermont publisher/bookseller got dragged into a brief exploration of bookstores in post-war Japan. 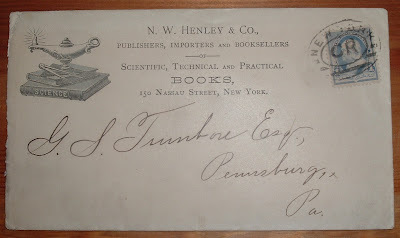 That Vermont publisher was of the Tuttle & Company family of Rutland, Vermont. I knew I had one of these ad covers in my collection, but forgot to include it in the other post, so it gets its own spotlight in this post. Researching the 3-cent Washington on the cover, I'd date this early 1870s. Booksellers, Stationers, Printers, Publishers... What didn't they do? Flip the cover over for more. Job Printing, Blank Books, Paper Hangings, Curtains, Wrapping Paper, Paper Bags, Twine, etc., etc. What about ministers? Somebody wrote out a doomsday message on the inside of the envelope announcing that the end was near. Tuttle's message to the addressee on the envelope? More likely it was Alvah F. Sherman (A.F. on the envelope) who scripted the dire warnings. He was a druggist in Ludlow, Vermont, as well as a dealer in books, pianos and a wide range of various and sundry things. And I've found several pages on the Internet that list his name and have something to do with Vermont Baptists. As a druggist, he had a product called Essence Hemlock (bottles and labels referenced on the Net). The Socratic cure for what ails you? 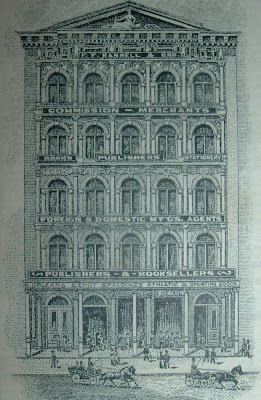 But for the winds of fate that first weekend in September of 1900, the building pictured above (and below), may have crumbled and the publishing & bookselling firm of F.F. 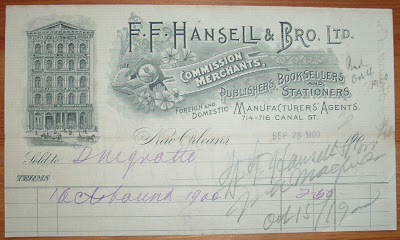 Hansell in New Orleans would not have had produced the billhead above. What if the Great Storm of 1900 that leveled Galveston on September 8, 1900--America's worst natural disaster--had caught steering currents that took it north well before a Texas landfall? Hansell's billhead, dated September 28, 1900, owes its existence to the elements of nature, whatever they were at the time: High pressure over New Orleans pushing the storm west? A weak front approaching the Texas coast, pulling the storm toward it? Whatever, this storm could just as easily have veered north with a change in conditions and destroyed New Orleans. A lot of these storms that enter the Gulf of Mexico seem to make that right turn before striking the Texas coast. We (Houston-Galveston area) got lucky last summer with Gustav. Not so lucky with Ike. Interesting to think about what might have been in 1900; least of all, what ephemera would have survived for collectors more than a century later. Mostly, I think of lives lost and future, unborn generations, and their contributions, and their progeny's contributions, that society lost. In recent months, I've written a few posts about old handbills that advertised books of the day. Stepping out of the antiquarian and back into the present, I have here a handbill promoting a book that was just published last year, 2008. I typically use this blog for posting about vintage ephemera related to the book trade, but this handbill is for a book that's very special to me: Chrome Horse Chronicles, by Fred O'Brien (Seaboard Press, 2008). I traveled vicariously with this author as he traversed the continental US, Alaska, and Canada on his Harley. And I listened to his stories when he returned from his journeys. I also read the drafts of his journals when he put those stories into writing from carefully recorded notes taken along each route. From Texas to the Grand Canyon, his first trip. From Texas through the eastern US into New England and beyond to Nova Scotia. Up the Mississippi River to its source in Minnesota. To the Rockies, from Colorado to Montana, and into Canadian prairies. To California and up the Pacific coastline. And his last great ride--Texas to Alaska. But these trips were not merely Point A to Point B, get on the Interstate and see how far you can go. He strayed from the Interstates onto the "blue highways," soaking up the landscape and the culture and humanity of its inhabitants. Fred collected his notes and journals from more than five years of traveling around the continent on two wheels and channeled his observations of places and people into a book format. I was privileged to read chapters as they came to conclusion and to hear about the progress, or lack of, in getting his book published. Through rejection slips and encouraging letters, he maintained a positive frame of mind. If it was worthy of publishing, it would find its publisher. If not, well, he had his journals to read, but more importantly he had the satisfaction of having lived a dream. He had gone out and done what many only talk about doing. And then he added another accomplishment--the daunting task of actually writing a book. Sadly, he would not live to see his book published. A driver pulled out in front of him on a Colorado road and Fred's journey on this earth ended. After some time, his wife, Carol, was able to continue with Fred's dream to publish his book. She made it her dream, too, and succeeded after a few years in seeing the finished product. The appreciation for writing that Fred and I shared extended to music, for which Fred was a walking encyclopedia. I learned much from him and shared a very special moment with him one night at a small Houston club. We met the legendary Rock and Roll Hall-of-Famer Levon Helm back in the club's kitchen between sets and I took a picture of the two of them together. Levon was truly an American musical icon to Fred. He told me the only other person he would do that with would be Bob Dylan. He didn't care about celebrity brushes with anyone else or getting autographs or posing for pictures. That just didn't interest him. We did get to see Dylan together one year, but it was at the Houston Livestock Show and Rodeo with about 50,000 other people. "You used to ride on the chrome horse with your diplomat…"
Fred used to ride a chrome horse, but the diplomat he rode with was himself. He was an ambassador of discovery, an honest man searching for grace. The farther he traveled on forgotten highways, as well as in life, the closer he got to himself. And the more he found of himself, the more he could see in others. His was a deeply meaningful journey into the lifeblood of a country, its people, and into the heart and soul of the observer on the chrome horse. Ride on my friend. Today marks 200 years since Abraham Lincoln was born, February 12th, 1809, in Kentucky. Coincidentally, I've been to the Abraham Lincoln Birthplace National Historic Site, and there's nothing there original to his beginnings except for nature. The buildings at the site have been constructed to serve symbolic purposes to help visitors get a feel for what life was like for the Lincoln family there. 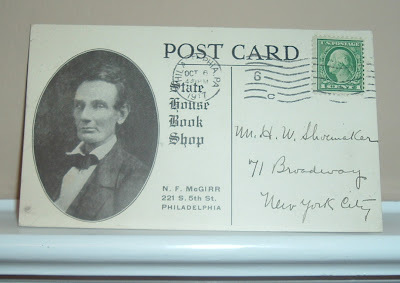 Segueing back to bibliophemera... this post card is from bookseller Newman F. McGirr of the State House Book Shop in Philadelphia, postmarked 1917. The front side sports an image of Honest Abe, while the reverse side offers information for a customer query. As the card is not signed or initialed, I can't say for sure that I have a holographic sampling from McGirr. But I have discovered a new bookseller I want to know more about. The use of the Lincoln image is a curious symbol for a Philadelphia book shop, whose owner seems to have more in common with Benjamin Franklin than Abraham Lincoln. That curiosity aside, ephemera such as this piece, offers more than just interesting graphics and bibliography. It offers an historical portal into the lives and culture of other worlds in other times. The portal in this postcard introduced me to Newman F. McGirr. McGirr appears to have been, in addition to a bookseller, a writer, editor, and publisher (thus my comaparison to fellow Philadelphian Franklin). I can find several references to works of folklore, particularly in Pennsylvania, that he was involved with. And more particularly, he had a special interest in music history of the region. I could also venture a guess that he was somewhat of a songcatcher, a Lomax contemporary, who had at one time his own record label. I did find mention of a book he wrote, which I have to get for my library: Experiences of a Pennsylvanian with Old Books, Bibliophiles and Old Records. I can't find anything more than the title and author (McGirr) and it seems to be long out-of-print and unavailable. As a book and music hound myself, I think I will enjoy reading this book. And I'll have Abe Lincoln and his 200th birthday to thank for introducing me to this interesting bibliophile/musicologist. 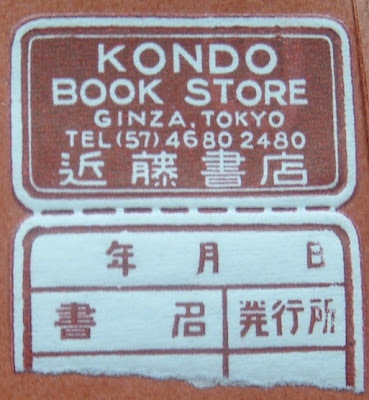 Here is my first Japanese bookstore trade label: The Kondo Book Store in the Ginza section of Tokyo. I found it in a copy of Homecoming, by Jiro Osaragi. It's been languishing for months in a backlog pile. I finally got around to looking at it and got a nice surprise in the form of some interesting history in U.S.-Japanese relations and psychological warfare following World War II. This English translation was a special reprint edition of Knopf's first English translation. 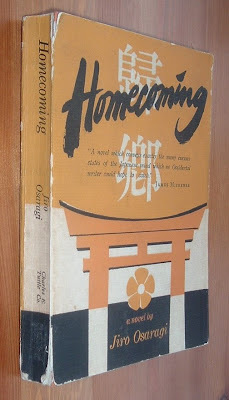 Published by Charles E. Tuttle (Rutland, Vermont and Tokyo) in 1955, this edition was sold only in Japan, Korea, and Okinawa. Perhaps someday I'll have trade labels from the stores in Korea and Okinawa that also stocked this book. As the book deals with life in postwar (WWII) Japan, and the publication time frame includes post-Korean War, I can see how the book wound up on the shelves of Kondo Book Store and bookstores in Okinawa and Korea. U.S. occupation of Japan ended in 1952, so my guess is that this book and other English translations were intended primarily for Japanese readers who wanted to improve their English skills. 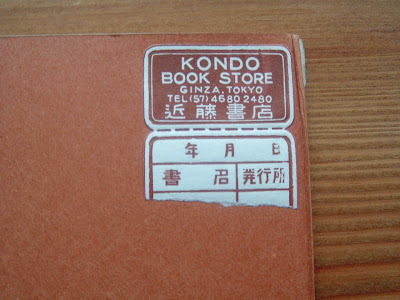 I was curious about the Kondo Book Store and its place in Japanese (specifically Tokyo) culture during the postwar years. I imagined Kondo and other bookstores playing important cultural rebuilding roles for a country devastated by war and seeking to redefine itself. But I found some very interesting information about another war that began during U.S. occupation--that of propaganda to counteract the communist propaganda machine that was fighting for the minds of the Japanese. The United States Information Service (USIS) used various media as tools to influence Japanese thinking. Films were perhaps the most popular form, but books were included in the mix as well. ...U.S. psychological warfare waged in Japan and other Asian nations during the 1950s, according to recently declassified U.S. government documents. The most extensive operations appear to have been in Japan, where U.S. officials secretly financed feature films, TV programs, thousands of hours of radio programming, hundreds of books, and numerous intellectuals. Like the Americans, the Soviets had their successes. "Bookstores are loaded with Communist books," warned the NSC report on Japanese intellectuals. Alarmed by these sales, including a bestseller on Marxist economics, the Americans pushed into publishing as well. By 1955, the USIS was behind publication of more than 100 books per year in Japan--and could boast its own anti-communist bestsellers. Payments or subsidies went to friendly authors and publishers. Was Charles E. Tuttle a "friendly publisher?" Charles E. Tuttle Publishing started in Japan in 1948, specializing in books about Japanese culture and English language books for Japanese readers trying to learn English. They are still in business today, as you may have already determined by clicking the link above. Tuttle was at the forefront of language studies between the two nations during this era and had a keen interest and understanding of what it would take to build good relations with a former enemy. Many English translations were published by Tuttle during the 1950s, which coincided with the USIS program. 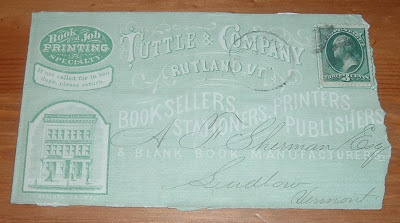 The Tuttle name has been associated with the printing and publishing business out of Rutland, Vermont since the 1800s. I'm not sure of the exact connection with the company in Japan, but there is a connection, perhaps a spin-off company of some sort. But I have to wonder if Tuttle's vision of publishing and bookselling in Japan coincidentally played into the hands of USIS initiatives, or did those initiatives recruit and place Tuttle into a prominent position to direct the Japanese mindset toward American interests? Charles E. Tuttle had served in the occupation forces and developed an interest in returning to start a publishing company. Whereas the bibliographic detail for the book containing the Kondo trade label seemed trivial before, it now seems to have a possible, and quite interesting, relationship to the psychological warfare waged in publishing houses and bookstores across Japan during the 1950s and beyond.